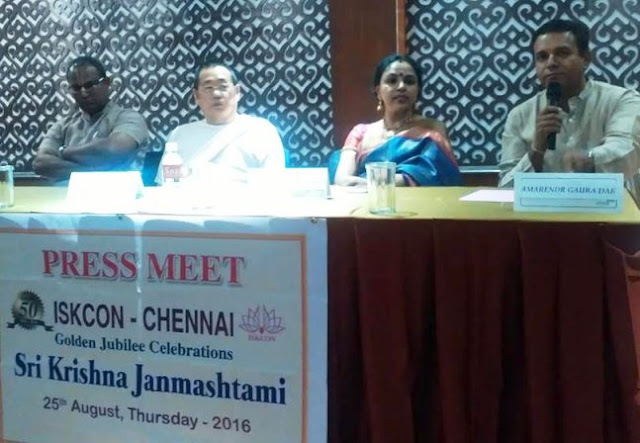 The International Society for Krishna Consciousness (ISKCON) is celebrating “Sri Krishna Janmashtami” on September 25th, 2015, Thursday at its center off the ECR. Sri Krishna Yajna will be conducted on 24th August from 3pm to 5pm. Followed by Adivas Ceremony, Arati and Prasadam, from 6pm onwards. Sri Sri Radha and Krishna, the presiding deities of ISKCON Chennai, will be bedecked in a special decoration on the occasion. Darshan will be open throughout the day. Special arrangements have been made to ensure smooth vehicle parking, quick movement in darshan lines and archanaseva. Prasadam will be served to all visitors. There will be devotional vocal concert from 7.00 pm, by Padma Bhushan Smt. Sudha Ragunathan, followed by a lecture of Shri H H Jayapata Swami. The main highlight of the day will be the elaborate Conch-abhisheka to the utsava deities Sri Sri Radha and Krishna Chandravali beginning from 10.30pm and culminating with Arati, Kirtan and Anukalpa Prasadam at 12 midnight, coinciding with the time of Krishna's birth. The next day, August 26, popularly celebrated as Nandotsav, is also the appearance day of Srila Prabhupada, the founder acharya of ISKCON. This is the 120th appearance anniversary of Prabhupada and the day is observed as his Vyas Puja as the spiritual master is the representative of Srila Vyasadeva. Thiru Ramkumar Ganesan, MD, Shanthi Theatres Pvt Ltd. will be the Chief Guest. Mr. Vikram Kapoor, IAS, Principal Secretary and MD, Chennai Metropolitan Water Supply and Sewerage Board and Actress Gautami Tadimalla will be the Guests of Honour on the Krishna Janmashtami Day function on 25th August 2016 (Thursday). Janmashtami commemorates the earthly appearance of Krishna, who is described in India's sacred writings as God Himself. One of the biggest religious festivals in the world, it is celebrated by nine hundred and thirty million people around the world. But why Janmashtami, you may ask? What's so special about Krishna, as opposed to any other form of God? It's His loving personality. He reciprocates in unique, personal ways with every devotee who offers Him love-He is the most adorable, mischievous son, the most romantic lover, the most compassionate friend. And on Janmashtami, devotees celebrate Krishna in all of these aspects. For just as Krishna reciprocates individually with His relatives and confidantes, he responds to the distinct feelings and desires held most deeply in the heart of every single worshipper. As per the vedic scriptures, the supreme personality of Godhead, Lord Krishna, descends from his eternal transcendental abode to this temporary material world in every millennium. The purpose of his incarnation is to display his extraordinary pastimes and impart his instructions in the form of Bhagavad-gita. This is just to give a chance to the people of this world to get free from the cycle of repeated birth and death, and to re-establish their eternal loving relationship with him. So remember that whatever way you worship Krishna on Janmashtami, He will reciprocate with you accordingly. It's a meditation that makes for an extremely rewarding devotional experience. Where Vaishnava temples exist, festivities begin before dawn and extend all day until midnight, the exact moment of the anniversary of Krishna's appearance. Events include kirtan, singing the Lord's name along with other devotees; and japa, private, more intimate prayer. Some devotees cook a feast of over five hundred dishes, while others perform drama and dance. Some clothe and decorate the deity of Krishna while others string enormous flower garlands and other decorations for the temple. Incense burns, scriptures are read, and all but the young and the infirm fast all day. The deities are also bathed with a variety of auspicious liquids in a kind of ablution ceremony called abhisheka. Sometimes taking over two hours, this is performed with great pomp. Finally, at midnight, priests pull apart the curtains to reveal thefreshly dressed deity of Krishna on a creatively festooned and coloredaltar. The excitement builds, and a rousing kirtan ensues.